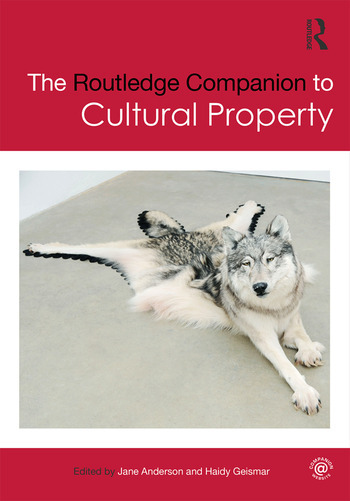 The Routledge Companion to Cultural Property contains new contributions from scholars working at the cutting edge of cultural property studies, bringing together diverse academic and professional perspectives to develop a coherent overview of this field of enquiry. The global range of authors use international case studies to encourage a comparative understanding of how cultural property has emerged in different parts of the world and continues to frame vital issues of national sovereignty, the free market, international law, and cultural heritage. Sections explore how cultural property is scaled to the state and the market; cultural property as law; cultural property and cultural rights; and emerging forms of cultural property, from yoga to the national archive. By bringing together disciplinary perspectives from anthropology, archaeology, law, Indigenous studies, history, folklore studies, and policy, this volume facilitates fresh debate and broadens our understanding of this issue of growing importance. This comprehensive and coherent statement of cultural property issues will be of great interest to cultural sector professionals and policy makers, as well as students and academic researchers engaged with cultural property in a variety of disciplines. Jane Anderson is Assistant Professor of Anthropology and Museum Studies at New York University. Her research is focused on property law, Indigenous rights and sovereignty, colonial archives, repatriation, digital return, collaborative research, and transformative practice for social change. Haidy Geismar is Reader in Anthropology and Vice Dean for Strategic Projects at University College London where she co-directs the Digital Anthropology Program. Her research interests focus on digital collections, Indigenous intellectual and cultural property, critical museum studies, the anthropology of economy and exchange, material culture and materiality, and digital anthropology.